At 13 to 18 hours long, non-stop trans-Pacific flights easily qualify among the most grueling in the world. But a surge in travelers between the USA and the Far East is spurring airlines toward a new era of time-saving convenience and money-saving competition. One big change: A trip to Asia no longer requires changing planes in Los Angeles, San Francisco or Honolulu and possibly again at Tokyo Narita. Increasingly common non-stop flights between other U.S. cities and other cities in the Far East are giving travelers more options in airlines, schedules and fares than ever before. Frequent-flier Larry Hotaling, a factory consultant from Florida who travels widely in Asia, says non-stop flights between the USA and new Far Eastern destinations have made his life easier. "I used to fly through Narita. Now I go direct from Chicago to Beijing, Shanghai and Hong Kong," he says. "You save time, and your body doesn't take such a beating." Tokyo remains by far the top destination for U.S.-Far East travel — 39% of the seats on non-stop USA-to-Asia flights are devoted to this market. But it, too, has taken a beating the past five years amid worries about terrorism, financial problems at Japan's flagship carrier, Japan Airlines, and the high cost of jet fuel. Seats for sale on non-stop flights to Narita fell 14% the past five years, but they increased between the USA and countries such as China, South Korea, India and Pakistan, a USA TODAY analysis of flight schedules shows. Back Aviation Solutions supplied the data. As global giants such as Wal-Mart, Hewlett-Packard and IBM have increased their business ties in the Far East, airlines on both sides of the Pacific have scrambled to add non-stop service between fast-growing Asian destinations and U.S. airports. Today, airlines fly six non-stop flights a day to Beijing from U.S. cities, four to Shanghai and two to Delhi, India. United Airlines alone has increased its U.S.-Far East seat capacity by 2% the past five years. It added two flights a day to its U.S.-Far East schedule the past five years, for 19 total. Graham Atkinson, a senior United executive, credits United's Asia push to "relentless economic growth" in China and the lifting of some government-imposed restrictions on international airline competition. After United increased its seat capacity to Beijing and Shanghai, it is now in a virtual tie with Northwest Airlines for U.S. airline leadership in non-stop capacity to the Far East. Northwest has cut capacity there since 2001. Travelers on the East Coast have gained more options. 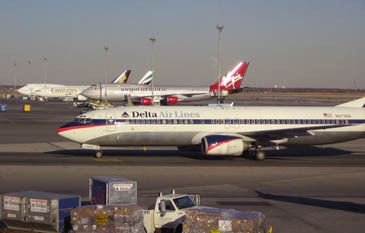 Eight of the 16 Far East routes launched since June 2001 depart from Newark, N.J., or New York John F. Kennedy airport, USA TODAY's analysis shows. Since last year, Continental Airlines has begun service from Newark to both Delhi and Beijing. "The market shifted as other markets opened up, so you didn't have to go through Narita to get to everywhere," says consultant Mo Garfinkle, who has advised U.S. and Chinese airlines on Asia strategy. As airlines expand their reach in Asia, travelers are finding more competition on certain routes. In 2005, South Korea-based Asiana Airlines joined South Korea's No. 1 airline Korean Air to fly Chicago-Seoul and New York—Seoul. Two years ago, United resumed daily service between San Francisco and Beijing, giving travelers an alternative to Air China's flights. The competition sometimes saves travelers hundreds of dollars. Since American Airlines began flying Chicago-Shanghai in April against United Airlines, consultant Doreen Huro Michelini is saving money and time. "That's the best thing that could've happened to me," says Michelini, a Chicago-based consultant who flies to China about every six weeks to set up and oversee factories. When United was her only choice, Michelini avoided buying its $1,800 round-trip coach ticket to Shanghai. Instead, she flew to Hong Kong, reachable for about $700 round trip, then transferred to a Chinese airline to get to Shanghai. The switch added a day to her trip but saved her hundreds of dollars. Three weeks ago, she says, United sold her a round-trip Shanghai ticket for just $856. She credits American's entry for the price drop. "So now I'm not only saving my money, I'm saving my time," Michelini says. Falling prices aren't the norm in the trans-Pacific market, though. With passenger demand strong and fuel prices high, the cost of air travel to most places is going up, Atkinson and other airline executives say. The average U.S.-Asia one-way fare last quarter was $871, about 6% higher than a year earlier, according to Sabre Airline Solutions. The average U.S.-China one-way fare jumped more — $1,099, up 8% from a year earlier. But prices aren't hurting demand, which seems to be rising as fast as supply. United, for instance, has filled 82% of its seats on its U.S.-Asia flights the past two years, up about 10 percentage points from five years ago. Airlines expect to continue adding more non-stop service in coming years, motivated by the lucrative business market as well as the promising tourism market. Korean Air, for instance, this summer is launching Seoul-Las Vegas flights and expects to fill many seats with Chinese tourists who love to gamble. The 2008 Olympics, to be held in Beijing, is also expected to generate more travel — and more flights.